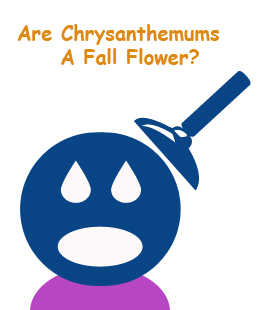 Are Chrysanthemums A Fall Flower? Chrysanthemums or “mums” are traditionally used in the early fall for decorating gardens and walkways but they generally bloom from late July to mid fall when the frost arrives. Formerly known as Dendranthemas, they are a hardy herbaceous perennial. They come in vibrant shades such as white, burgundy, lavender and many other bright colors. When coupled with Indian corn, pumpkins and gourds they become a wonderful fall decoration in the garden or around the front door and stairs. Chrysanthemums are hardy and enjoy full sun in well drained compost infused soil. They bloom in response to shorter, cooler days and longer nights. If you are ambitious and want to grow your own, you will need to start them in the spring. They are a little more difficult to grow than other flowers such as marigolds. Marigolds are easy in that all you need is seed, soil and water. Mums are grown using stem cuttings. You will need to “pinch “them to stimulate new growth. Pinching is simply removing the tips of new growth to send out side shoots. Stop pinching them by the beginning of summer. Plant them in masses but do not overcrowd. If you purchase them from a catalog make sure they are “hardy mums” and single stemmed rooted cuttings. Mums are fairly inexpensive to purchase. 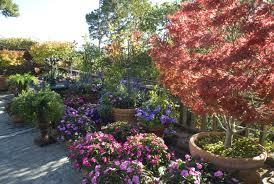 They look beautiful in their pots or they can be planted in the ground at least six weeks before a killing frost. Chrysanthemums are able to withstand a light frost and even the first snow storm. Chrysanthemums originated in China where the flowers were used to make chrysanthemum tea for influenza patients. Florists love mums because of the longevity of their blooms and their vibrant colors. When used as cut flowers they will out live their neighboring flowers. As mid fall approaches and trees are losing their bright fall leaves, mums will still be there to offer colors for the eye to feast on.